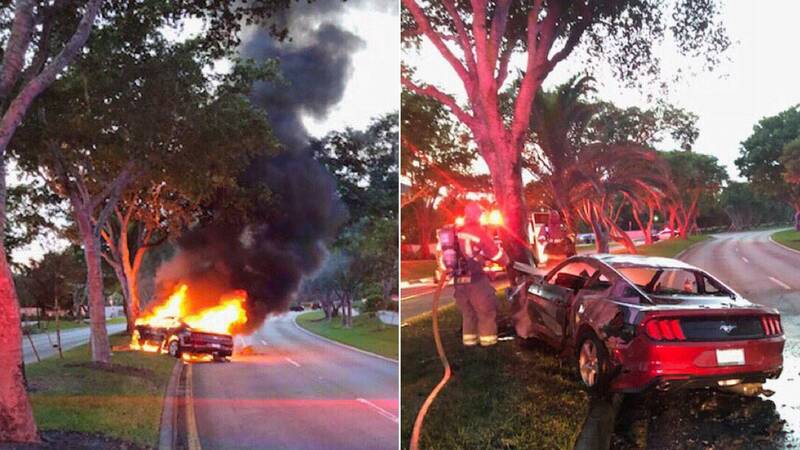 DAVIE, Fla. - A Davie police officer pulled a driver from a car moments before it burst into flames Wednesday along Shenandoah Parkway, authorities said. Davie police said the driver lost control of his Ford Mustang and crashed into a tree near Appalachian Trail. Police said the driver suffered minor injuries. Firefighters with Davie Fire Rescue quickly brought the blaze under control, police said. Police briefly closed Shenandoah Parkway from Amhurst Avenue and Oak Ridge Drive to clear the scene. The parkway has since reopened.